The Trans-Pacific Partnership (TPP) is one of the biggest international trade deals in history. It might be the biggest, once all the numbers are crunched. It’s an agreement between 12 Pacific Rim countries, most notably Canada, the USA, and Japan –and most significantly excluding China– that is expected to be accepted by all signatory nations sometime in the next year. Like most trade deals, the TPP deals with reducing tariffs and setting limits on such things as what percentage of a product must be made in a certain country to be allowed into its market. In Canada, the signing of NAFTA was a profound national issue, even essentially becoming a referendum issue in the 1988 election. Similarly, TPP has become a dominant issue in the current election, which takes place today. But, though TPP dwarfs NAFTA in many ways, Canadians don’t seem as engaged with its impacts as they did with NAFTA’s decades ago. The details are (supposedly) not yet known. The government of Canada offers its version of a technical summary, as well as a breakdown of where they perceive the benefits to accrue. The Conservative Harper Government (as he prefers them to be called) is incentivized to communicate their deal in the best possible light, of course, so the sites linked above are clearly biased. They are also bare summaries that omit many critical details. Luckily we live in the age of digital Robins Hood. Wikileaks has released portions of the actual text, including its most critical chapter (from my perspective), having to do with privacy rights. The TPP will clearly have dramatic financial benefits for key sectors, among them energy and natural resources. Opening up our fishing, lumber, and oil industry to the Pacific market might bring in great wealth to important economic centres in Canada. As well, it’s a good argument that some kind of trading bloc needs to be assembled to combat the growing dominance of China on several trade fronts. It’s an even better argument that since some key countries, like the USA, are going forward with a trading bloc, that Canada would be well advised to be a part of it, lest me miss out on the gravy train and end up excluded from long term market opportunities. But there are profound negative consequences to the deal, many of which I would argue have no place in an omnibus trade bill that is ostensibly about the flow of raw physical products between nations. I’m speaking of intellectual property and privacy issues, which I will detail below. Now, if your values are such that you feel an increase in monetary wealth is worth the severe curtailment of individual privacy rights, then it is understandable that you’d support the TPP. But my values hold that individual privacy and freedom are immeasurably precious. If one must trade them, then such assets should be sold dearly indeed. And the projected benefits of the TPP do not even come close to justifying the damage that the agreement will do to our civic rights. What follows is a summary of my specific objections to the TPP. One of the objections to TPP is that it was negotiated in secrecy and presented to the Canadian people as a done deal. However, that is the norm for large trade negotiations. It makes some sense: if you have to publicly put all your cards on the table, it weakens your negotiation position. The problem, though, is when you consider the parties who were not excluded from the details, specifically corporate lobby groups. It seems that 605 corporate insiders have been allowed access to this “secret” text, which maybe have been influenced by 331 corporations or related organizations, leading to strong speculation that the TPP was pretty much written by industry lobbyists and insiders. Well, you might ask, who better to write industry trade rules than industry trade people? The problem is that what is being traded is citizens’ rights. It seems everyone was around the drafting table except for the parties to be most affected by the deal: citizens groups, environmental groups, labour rights groups, etc. In other words, the negotiation’s semi-secrecy disproportionately benefits one pillar of society –the corporate, industrial sector– at the expense of all other stakeholders, most notably the common citizen. As noted, while some sectors in Canada benefit from the TPP, others will suffer. In particular, the auto parts industry, whose heartland is Ontario, stands to lose big. The auto industry in Canada is worth $20 billion and employs 120,000 people. Current NAFTA rules hold that 60% of parts in a car sold in Canada (even those imported) must be made of Canadian parts (and 62.5% of a fully assembled car). TPP changes that number from 40-45%. Critics claim this will cost Canada (i.e., Ontario) 20,000 jobs and untold millions of dollars. The auto parts trade surplus became a deficit in 2007; TPP will exacerbate that condition. On its face, TPP also offers Canadian can manufacturers a more amenable market in Pacific Rim partners. But who are we kidding? No one in Japan is going to be buying Canada-made cars anytime soon. One of the more daunting aspects of TPP is its extension of copyrights over a variety of intellectual products to an additional 20 years past their present dates of expiration. Clearly, the TPP’s planned extension of copyright is motivated by the US film industry’s desire to curtail profit loss at the expense of the spread of cultural content. I’m on record of believing that content should be shared and not controlled by business interests. In New Zealand, some estimate the copyright extension will cost taxpayers $55 million annually in royalty payments to foreign (i.e., American) concerns. Canada, being significantly bigger than New Zealand, in terms of both population and cultural output, would end up paying at least $100 million per year as a result of TPP copyright extensions. Who does this benefit? In a small sense, it might benefit the descendants of authors and artists who get to profit a little longer from their ancestors’ creations. In a larger sense, it benefits very large corporations who get to fend off the arrival of generic versions of their products, thus maintaining higher prices for additional decades. Nobel Prize-winning heroes, MSF or Doctors Without Borders (whose infographic I have stolen for this article) has expressed grave concerns over the TPP’s effects on drug pricing. From my own experience working in low income countries, when pharma companies (or, more specifically, the US government) flexes their policy muscles and somehow compel a government to deny the presence of generic drugs, the cost of live-saving interventions increases so much that million-dollar programs meant to help entire nations shrink to serve only a few thousand people. 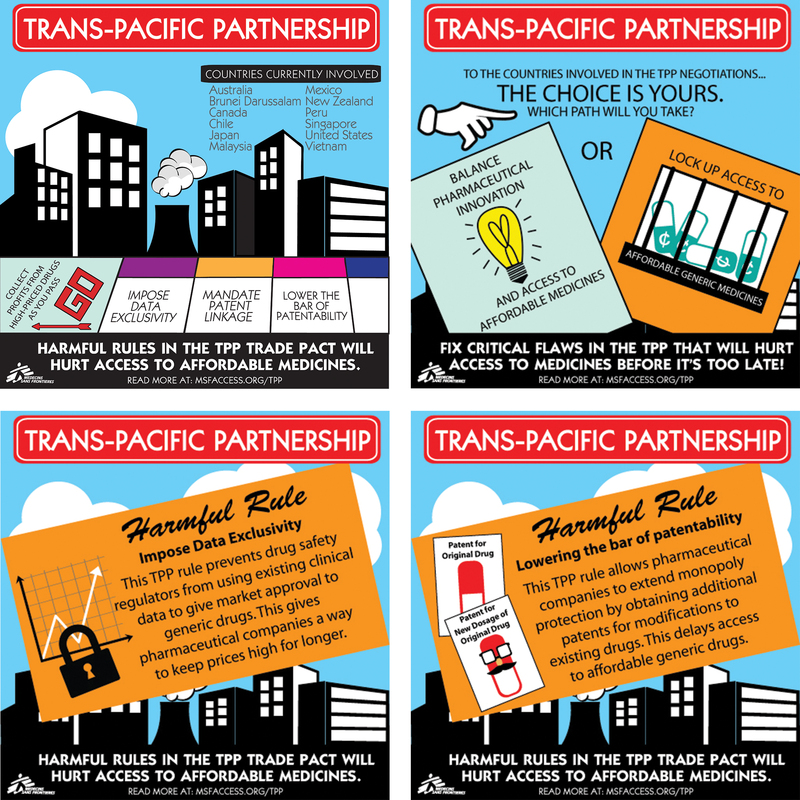 MSF argues that TPP is a more aggressive form of TRIPS, a WTO agreement that nearly was the death knell to millions of HIV sufferers, due to draconian drug pricing allowances. MSF points out that 80% of affordable medicines used in poor countries (which, remember, constitute the majority of human race) are manufactured in India in generic form. TPP essentially puts an end to that, by preventing signatories from using generics in potentially a host of scenarios affecting poor communities. For more detail, read the MSF brief. But essentially their objections boil down to the fact that TPP seeks to lower the bar of patentability, patent medical methods as well as products, prevent governments from permitting generics while label drugs’ patents are still valid, extend that period of validity, and –amazingly– prevent regulators from accessing much of the clinical data needed to make decisions about safety and patentability! I love my free Google services. And I love all the free stuff I get from Facebook, in the sense that I get to stay in touch with friends, get videos and jokes, etc. It’s made my life better… for free! Except it’s not free. We pay dearly for it, by trading the most valuable commodity in the modern economy: our personal information. Now, when it comes to Google and Facebook, we choose to make that trade. I have the option of not signing up for those services. Thus I made the trade willingly. With TPP, our privacy and individual personal information is being traded wholesale to foreign interests (most notably the US government) in exchange for…. what? Some extra trade benefiting a handful of industries? So the NSA gets access to all my information, just so some dairy farmers can raise their prices? I had no say in that swap, and I do not agree to it. TPP denies “data localization”, which is the act of maintaining your data within a given jurisdiction. For example, Canadian researchers are encouraged to use FluidSurveys instead of SurveyMonkey for our online research, because the former keeps all data in Canada, whereas the latter has data servers in the USA, making such data sensitive to American security laws, specifically the Patriot Act. The same applies to the software universities use for course management. My school prefers Blackboard over some cheaper competitors, in large part because that company ensures that students’ personal information remains within Canada and does not dip into American servers. All research done on any population, even vulnerable populations, will be denied data localization, meaning that ultimately foreign security concerns (i,e., the American government) and possibly even domestic and foreign corporate concerns could theoretically have access to these data. The same logic applies to health data. Presently, provincial laws seek to keep electronic health records somewhat local. TPP limits governments’ ability to keep those data close. Imagine any government agency, domestic or foreign, learning what medications you are on, or what illnesses you may suffer from, or what conversations you might have had with a care provider. It is unclear what provisions are in place to prevent the scenarios I outlined. But that’s the point: due to secrecy and lack of transparency, neither experts nor citizen advocacy groups have been able to alert negotiators to the privacy weaknesses of the deal, nor to possibilities for how to abrogate such weaknesses. In other words, this is a deal that trades the identities, rights, and futures of individual citizens for the potential to make a few more dollars in a handful of sectors. It’s a deal that disproportionately benefits large American corporations and American security interests, and does little for Canadian citizens. Regardless of which party is elected tonight, let’s pressure the new government to re-think the TPP. If you’d like to learn more about the problems with TPP, I recommend the blog of my colleague, Dr Michael Geist.